Rhubarb heralds Spring in Vermont. Pink sprouts push up from the cold earth. The familiar litany of questions heard around town – at the post office, the Creamery, the market, and at community dinners. 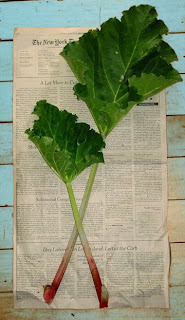 And then the rhubarb appears – over night, huge green leaves pop up. The first garden harvest of Spring. 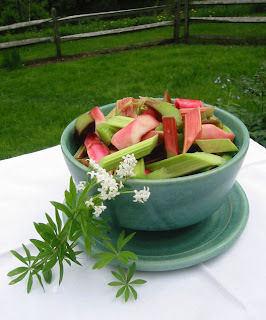 Although technically a vegetable, I think of rhubarb as fruit, the primary ingredient in one of my favorite pies, as a lovely sauce eaten alone or topped with a dollop of yogurt (see post below), or starring in a chutney or relish. I cut a pound of stalks into two inch pieces, stirred in a quarter cup of sugar and then weeded my garden for half an hour. Then, I poured the rhubarb, along with juice that had formed, into a buttered ceramic baking dish. After baking at 350 for half an hour, I poured in a quarter of a cup of heavy cream, topped with a sprinkle of freshly grated nutmeg and returned it to the oven for ten more minutes. This is best eaten right out of the oven with a thin silver spoon, but no one will complain if it is served as dessert or with granola at breakfast. In New England breakfast is often a piece of pie. This custardy pie with a steamy cup of hot coffee does the trick. Heat oven to 375 degrees. I use a pie crust from the refrigerator case at the market and a glass pie pan, home made crust and any shape baking pan will work. Roll piecrust about three inches larger than you pan so that the piecrust hangs over the edge of the pan. 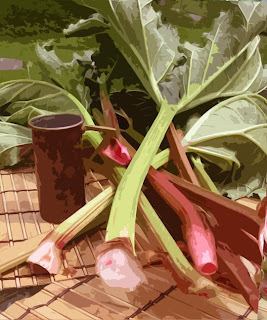 Mix together, in this order to avoid lumps, one and a half cups sugar, four tablespoons flour, three tablespoons milk, one teaspoon nutmeg, three beaten eggs, and four cups sliced rhubarb. Pour into unbaked crust, fold pastry onto filling, sidestepping the need to master fancy lattice work. Bake for approximately 70 minutes or until the crust is brown and the custard has set. Click here to subscribe to the newsletter from Carol’s Kitchen. Old fashioned rhubarb pie with custardy filling. Pre-heat oven to 375º. Mix together, in this order to avoid lumps, sugar, flour, milk, nutmeg, eggs, and rhubarb. Pour into unbaked crust, fold pastry onto filling, sidestepping the need to master fancy lattice work. Spring must be so beautiful in Vermont! 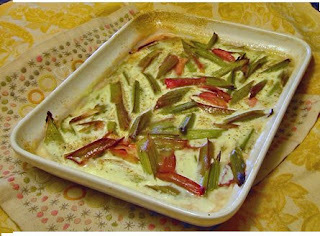 The roasted rhubarb looks delicious! I also loved going through your recipe.